Process, in its various forms, is foundational to our legal system. Water law is no exception. For thousands of years, transboundary waters have been the root of conflict and even war. A recent report commissioned by the State Department concluded that many more such disputes are likely in the future. The Great Lakes Compact, a binding regional agreement between Illinois, Indiana, Michigan, Minnesota, New York, Ohio, Pennsylvania, and Wisconsin, has so far at least provided an interesting counter-example to this trend, in large part because the signatories were able to agree on a common decision-making process. In many ways, in fact, the Compact is a process-driven document. Substantively, it generally prevents new or increased diversions of Great Lakes water outside the Great Lakes Basin. Member states must use a common, consistent decision-making standard to evaluate proposed uses of Basin water in their jurisdictions. Some more controversial proposals, such as diversions of water to communities in “straddling” counties (more on this later) are subject to a regional review process requiring unanimous consent of the member states. The Compact’s ultimate impact will not be known for years to come, but two early Wisconsin test cases provide interesting data points demonstrating how the process works on both state and regional levels. 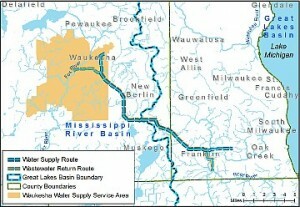 In one very recent case, a company proposed to extract well water from Presque Isle, Wisconsin, in the Lake Superior basin, and ship it by tanker truck to Minocqua, Wisconsin, in the Wisconsin River (and ultimately, the Mississippi River) basin. There, the company planned to bottle the water and sell it on the multi-billion dollar global bottled water market. The site proposed for the Minocqua plant is just a few miles outside the Lake Superior basin. After reviewing the proposal using the Compact decision-making standard, the Wisconsin Department of Natural Resources informed the company that, as constituted, the proposal would violate the Compact as an unlawful diversion of water outside the Great Lakes basin. The company subsequently abandoned its plans. Interestingly, had the company simply constructed its plant in Presque Isle instead of Minocqua, it could have bottled the water there and sold it outside the Great Lakes Basin; the Compact contains an exception for water transported in containers smaller than 5.7 gallons. It’s unclear why Presque Isle didn’t attempt to convince the company to do just that; at least one Great Lakes municipality has taken to marketing itself based on the “huge amounts of [Great Lakes] water” it can supply to water-intensive users. Perhaps the company’s decision can be explained by previous research tending to show that companies rarely make siting decisions based on environmental regulations; other conditions often predominate, including tax structure, wage and benefit requirements, and availability of a skilled workforce. Of course, the far more high-profile case is the application of the City of Waukesha, Wisconsin to contract with the City of Oak Creek, Wisconsin for the supply of Lake Michigan water for municipal purposes. Although Waukesha is located outside the Great Lakes Basin, it lies within a “straddling county,” and therefore is eligible for a diversion if numerous requirements are met. These include, for example, that the applicant has no “reasonable alternative” supply, that the use is limited to a “reasonable” quantity, and that there is no significant individual or cumulative adverse impact on the Great Lakes basin, among other factors. Pursuant to the Compact, Waukesha’s application must be considered first by the Wisconsin Department of Natural Resources, and then unanimously approved by the governors of all Compact signatory states. The prospects for that outcome remain unclear at best, but the process has begun. The long-term effectiveness of the Compact is a subject I expect to revisit in future posts; but these two test cases show that the process, at least, appears to be working. Previous Previous post: The Securities Act: Does It Permit Companies To Cheat Investors?